The camera on your iPhone is a great way to capture little bits of info that you want to remember later—say, a piece of furniture you saw when you were out shopping the previous weekend. The problem is, it’s too easy to lose the context of that photo when you’re looking back through your images—like trying to remember the name of the store where you saw that piece of furniture you photographed. PhotoNote by BananasDesign allows you to take photos with your iPhone and attach notes to them for easy reference. There is also a free version of the app—PhotoNote Lite—that only allows you to save up to four notes. The way PhotoNote works is very simple: when the app is launched, you see a list of your notes with a small photo thumbnail. You can order notes by date, category, or alphabetically. A Picture’s Worth 1000 Words: With PhotoNote, you can append written notes to photos you take with the iPhone’s camera. You can also organize notes by category. 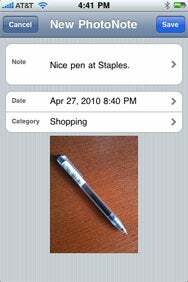 To add a new note, you tap the familiar “plus” sign in the upper corner, and you are given three options—take a new photo with the camera, choose an existing photo from your library, or add a note only. After you take a photo with the camera (or select one from the library), the screen changes to allow you to enter the note. You can also choose the category that the note falls under—besides built-in basic categories such as Shopping and To Do, you can also enter your own. You also see a small version of the photo below (which you can tap to enlarge). Each note can also be e-mailed directly through the app, with the full photo and notes attached. There are a few helpful settings you can select in the Settings app. You can have PhotoNote open directly into Camera mode, or choose to have the entire app password protected. You can also decide if you want the photos that you take within the app to be saved to the camera roll. If you’re taking a bunch of photos while out shopping, you may feel it’s better not to have them clutter up the rest of your photos. One feature that seems to be missing is the ability to search notes. If you were to fill the app with a large number of notes, alphabetical ordering is not enough to help you find what you need; a true search would be necessary. As I mentioned, PhotoNote Lite is free, and offers the same functionality as the paid version, while limiting the amount of notes that can be saved. Four notes won’t take you very far, so the PhotoNote Lite feels more like a demo. If you like the concept and usability, you’ll want to spring for the full version. PhotoNote needs to fill in that search feature before I’d truly rely on it for heavy use. But it can still come in very handy when you need to keep some notes alongside your photos.